Quite possibly the most recognized of all the Celtic symbols is the knot. The elaborately interwoven design with no end and no beginning is thought to be an expression of the Celts’ belief in eternity. The Druids and the ancient Celts believed in a life without end, with death only being a transition into a new phase. While all knot patterns contain this element of life-everlasting, certain designs are believed to carry more specific meanings. For example, the triquestra or trefoil knot points to the importance the Druid’s placed on the number 3, the number of fate. 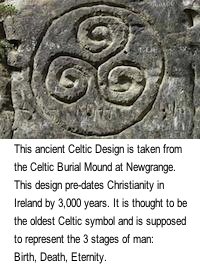 This design was such a hallmark of the Celtic people that Irish Christians found a way to bring it into their new faith by adopting the symbol as a representation of the Blessed Trinity. There seems to be a lot of debate as to the true meaning of spirals in Celtic art. The direction of the spiral and the number of rotations appears to affect the meaning behind the image, therefore we will discuss some specific configurations. Triple Spiral- is also known as the triple Goddess or triskele, symbolizing the maiden/mother/crone phases of life or the three phases of the Moon. Double Spiral- signifies balance. Also believed to portray the equinox, a time when day and night are equal in length. Clockwise Spiral- While the Druids tended to favor the Moon in their symbolism, this design is actually a representation of the Sun. A loosely wound spiral would embody an expansive summer sun while a tightly wound spiral expressed the shortened days and long nights of winter. Symbolic of the journey we take in life, the labyrinth was often used during prayer or meditation. Focusing on the design reminds us that life is full of options, and open doors, as well as obstacles to overcome. Finally, we come to the simple circle, the building block for mandalas as well as Celtic imagery. Much like Gods’ love, the circle is never ending. It is a universal symbol of the cycle of life; birth-death-rebirth. The intertwining of circles is the basis for many Celtic knots with the number of circles often symbolizing something more. Note that by combining 3 circles the aforementioned triquestra knot is formed in the center. On the other hand, five circles linked together form the circle of being; a Druid illustration of the four earthly elements being forever united by a fifth element, balance. Michelle Normand is a graphic designer, freelance writer, and author. To date her books have been published in both the U.S. and Japan.